For over a decade now Quicken has been helping millions of users sort out their daily financial issues. Although times have changed, the truth is that many Quicken functions have remained the same. After all, it’s hard, not to mention pointless, to try reinventing the wheel, but Quicken has been able to adapt to technological changes and implement them to the benefit of users. The most prominent addition to latest Quicken versions is the inclusion of mobile apps. Recent trends have put all we do and how we do it in our palms and allow us to access all corners of our lives anywhere there is reception or internet connection. You can now check balances, budgets, enter transactions, pull receipts, and sync anything you performed on your mobile device with a computer. Quicken is now available on iPhone, iPad, and Android devices. Mobile app that syncs information between a desktop, tablet, and smartphone; transactions entered on a wireless device are updated across all devices you use. Take photos of receipts, statements, check images, photos and other documents and tie them to a particular transaction. See payment reminders in Quicken register and they can be displayed automatically providing an immediate effect on your current and future balances. Email and text alerts – there are over 15 customizable alerts you can have delivered to your phone or mailbox in situations such as going over budget, large deposits, high spending warning, fees being charges, etc. You can select which accounts should be considered for this service. Track your loans – get a clear picture of your every loan that includes a chart of the total amount and principal balance paid, most important features of a loan, breakdown of where every dollar of a monthly payment is going, and a chart of a projected payoff. Set savings goals – in Planning section create new goals, add your name, amount, and date by which you want to reach them. Quicken then calculates monthly contributions you need to make to get there. Flexible budgets – great new feature letting you see a budget for the entire year; this is your personal income statement with all the details; make adjustments as necessary and leftover amounts are rolled over to the next month. Improved search functionality – improvements in search portion will help you find what you’re looking for faster than before; search by date, amount, or key word, and sort data as you please. Show/hide accounts – accounts that are no longer active can be hidden and will not appear in your view. Import of bank transactions and automatic classification into appropriate spending category. Reminders to pay bills and graphical cash flow presentation. Customizable plans to reduce and eliminate debt. Setting up savings plans for anything that strikes your fancy. Seeing your accounts in one place. Those features have been improved over the years and define the product. They expended the number of financial institutions with which they are compatible, but the basic premise remains the same. Note: The new, improved, and redesigned features apply to Quicken for Windows. Many of the features of Quicken Essentials for Mac overlap those mentioned above. 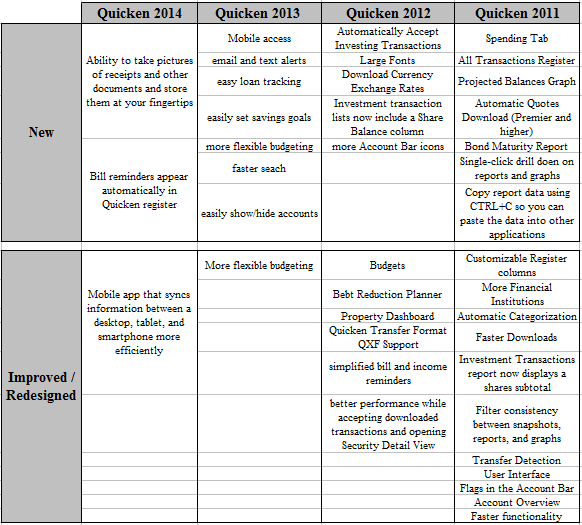 What features would you like to see Quicken in the 2015 version? Leave your thoughts below! I found the “FIND” function in my previous Quicken very useful. However I cannot find it in my 2014 version. How can I install it in my 2014 Quicken?